The Friedley-Voshardt logo on the Warren, Ohio Doughboy. Although most of Viquesney's pressed sheet copper "Spirit of the American Doughboy" statues bear his name and copyright, most also bear no founder's mark, but are suspected to have been manufactured by the Friedley-Voshardt Company of Chicago, Illinois, because three of them can be directly traced to that company. The statues at Warren, Onio, bearing the nameplate above, and Garfield Park, Chicago, Illinois, below, referred to in a Friedley-Voshardt catalog page. A Friedley-Voshardt sales invoice for the Fort Worth, Texas Doughboy appears on our Business Correspondence page. It is thus the opinion of the Smithsonian Institution that Viquesney's other sheet copper statues were made by the same company as well, as it would have been prohibitively expensive to produce several molds for different companies. However, in 1934 the Great Depression did force Viquesney to cut a new, much less detailed Doughboy mold, designed to be used for casting the statues in cheaper zinc. These were sold for as little as $700 and were made by the Raphael Groppi Studio, also of Chicago. These later, zinc models of "The Spirit of the American Doughboy" are described here. In addition, three stone versions of the statue were made by the McNeel Marble Company of Marietta, Georgia. The company also produced a lookalike statue that was identical to Viquesney's version, only it was lacking the backpack and gas mask pouch. 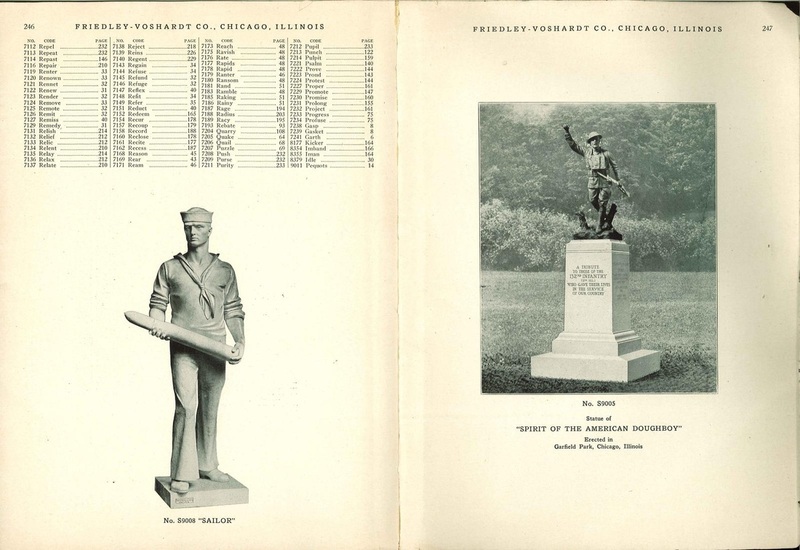 1926 Friedly-Voshardt catalog pages featuring Viquesney's ''Sailor'' at Palatka, Florida, and his ''Spirit of the American Doughboy'' formerly at Garfield Park (now at Soldier Field, Chicago, Illinois).